The bodies of two former Navy SEALs were found on board the Maersk Alabama, the same cargo ship which was hijacked by Somali pirates in 2009 and portrayed in the film Captain Phillips. According to police, Jeffrey Reynolds and Mark Kennedy, both 44, were discovered dead by a colleague who went to check on Kennedy late Tuesday afternoon while the ship was moored in Port Victoria. No cause of death was given and an investigation is underway. A.P. Moller-Maersk said in a statement, "The cause of the death for both men is part of the ongoing investigation, but it was not related to vessel operations or their duties as security personnel." Reynolds and Kennedy both worked for Trident Security Firm USA, which identified the men as former Navy SEALs today. Local law enforcement agencies were investigating the deaths on the Maersk Alabama, which berthed in Port of Victoria around midday on February 17. The security contractors had boarded the vessel on January 29, Maersk said. Maersk Alabama is part of a U.S.-flagged fleet controlled by Maersk Line Limited, a unit in A.P. Moller-Maersk, which performs military, government and humanitarian missions by transporting cargo on its container, tanker and multi-purpose ships, according to the company's website. It said the Maersk Alabama is persistently in high-risk areas since it provides feeder service - calling at smaller ports to collect containers that are later loaded on bigger container vessels - to the east coast of Africa. 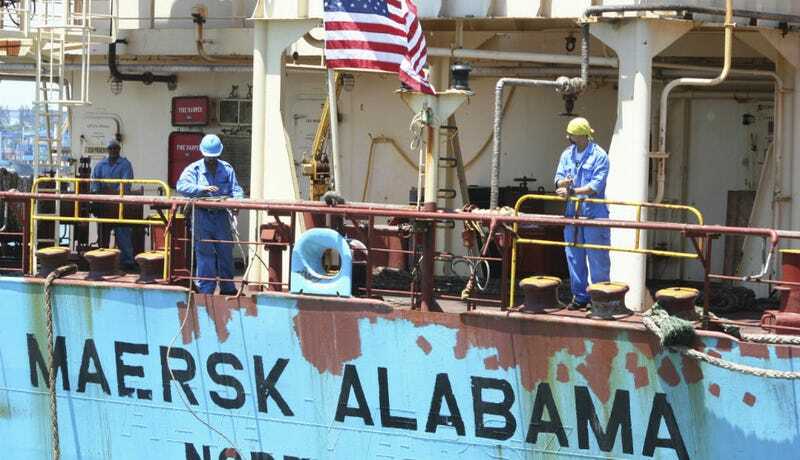 A 2009 hijacking of the Maersk Alabama, during which Captain Richard Phillips was held hostage by pirates in the Indian Ocean, inspired the Oscar-nominated film Captain Phillips.